We need to remember that there are no two people on this planet who are physiologically (mentally or physically) identical. Therefore, each person must first interpret a given situation (process, problem, opportunity or work environment) in their own particular way before they can or will take some action. Engineers can develop efficient processes and systems but there is no such thing as a perfect social system or network. Some people still think they can develop efficient social structures. They are, unfortunately, pursuing a fairy tale. Complex adaptive systems (self-organizing systems) such as social systems or networks develop certain distinguishable patterns (dynamic order) over time but those patterns are in constant motion. For instance, it only takes one person in a complex adaptive system (network) who happens to have a “bad day” to change the particular dynamics of that network. It’s best to remember that people are not machines by any stretch of the imagination. That’s why more education and training or trying to change a culture can only take an organization so far. It can never lead to some form of total perfection when it comes to social systems. For example, “Does every pilot fly the same plane exactly the same way?” That, of course, is an impossible feat. There is, however, a big difference between dynamic order and chaos when it comes to social systems. Nevertheless, let’s not deceive ourselves into thinking that we can somehow develop perfectly functioning social systems. One doesn’t have to look far to see the misery we create by treating people like machines. 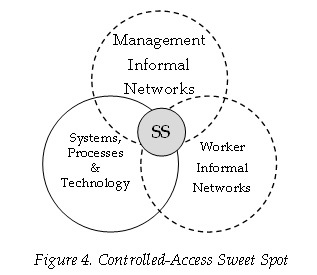 Greater emphasis needs to be placed on expanding what I call in my latest book “the organizational sweet spot” where the formal and the informal systems overlap as shown in Figure 1. That is, under the right conditions, the informal components will begin to overlap more and more with the formal elements of an organization’s systems, processes, applied technologies and general management. Thus, the sweet spot is a very desirable state for any enterprise. It’s a natural outgrowth of day-to-day interactions or “self-organization” of goal directed people in the “Un-Management” realm of a venture. More precisely, the un-management sphere of influence of an enterprise encompasses two vital areas depicted in Figure 1. 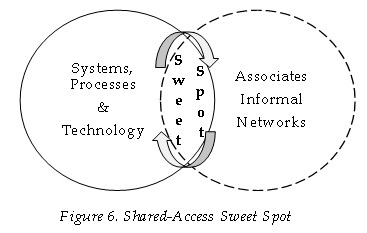 They are the sweet spot and the rest of the informal networks. Hence, organizational leaders should try to make every effort to design work contexts that “encourage” members to participate as frequently as possible in the sweet spot activities. Inherently, leaders should learn how to “unmanage” more and place less and less emphasis on traditional management founded on control and compliance. Unmanagement is based on the proven theory that human productivity is at its peak in “naturally” occurring networks and relationships as opposed to within formal systems where people are stifled by bureaucracy and not allowed to work openly with their counterparts and peers. Most people will support formal organizational goals if they understand how the goals benefit the business, its customers, society as a whole, their fellow workers, and themselves. It’s surprising how many employees in general are clueless of such outcomes. Therefore, one can have a very productive and engaged workforce when you treat people humanely and when they grasp the benefits cited above. The key to success is to fully understand what can and can’t be controlled within social systems. What we need to fully grasp is that, as depicted by Figure 2, organizational contexts can be managed or adjusted but not the people who work and function within those work environments, especially when it comes to the sweet spot. The reason for that is straight forward. People’s mindsets and relationships are emergent and thus can’t be managed. That is, they can be influenced but not controlled. Unfortunately, that subtlety as to what can and can’t be controlled in a work environment is still hard to grasp for most people. Accordingly, for productivity and innovation to thrive, people need to be immersed in flexible biophysical and social environments. Consequently, it shouldn’t come as a great surprise that traditional management concepts seldom work well any longer, especially when it comes to knowledge workers. This is mainly due to the continued use of a cause-and-affect machine metaphor when dealing with workers. But people are not machines. They are organic self-organizing entities from their DNA molecules to their interactions with other people. 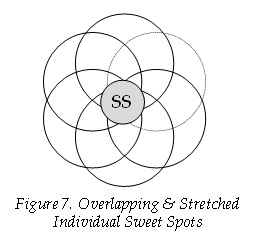 Every organization has a sweet spot or multiple sweet spots. In most organizations, however, the sweet spot is rather small. We need to keep in mind that at the sweet spot most activities are based on reciprocal relationships, valued differences, and respected individual identities. The pursuit of creativity and innovation is enhanced through the persistent encouragement of constructive dissent in an atmosphere of mutual trust. One of the great attractions and positives of working in a sweet spot is that everyone is actively engaged in assuring that all activities, resources, and rewards are “equitably” managed by all participants. So what are the primary choices we have when it comes to organizational ecologies or contexts? In my first management book, Unleashing Intellectual Capital, I placed organizational structures into just two very broad general categories: controlled access systems and shared-access systems. In this classification scheme, a controlled-access system, whether tall or flat, is an organizational framework wherein one individual or a very limited number of people exclusively control access to all major resources including the workforce. All other members of the organization must first get approval from these top people before any of the assets can be used or invested. In a controlled-access system position power is the predominant force behind all key decisions; hence, “open” self-organizing arrangements are not encouraged or valued, limiting the development of high levels of “voluntary” goal directed social connections. In other words, compliance instead of commitment is prized in such organizations. Clearly, in such a context a considerable segment of the workforce can becomes disengaged from their designated tasks. In contrast, in a shared-access system all organizational members have considerable autonomy in decision-making and in resource allocations including hiring and firing of people. In a shared-access system, expert power instead of position power dominates. Thus, major emphasis is placed on situational leadership, open book management, and self-organization in solving problems or in pursuing opportunities. Here, personal commitment rather than compliance is the dominant success factor and most people are productively engaged in their work. The message for today’s organizations is that since they must interact with a constantly changing, information-rich and complex environment, they must be equally multifaceted and flexible in order to survive. Thus, the long-range goal of any organization should be to function like a shared-access rather than a controlled-access system. Does that mean that all controlled-access organizational ecologies should be abandoned? Not really. Enterprises are and can continue to successfully operate in a controlled-access mode. However, what the leaders of such organizations need to understand is that if they want to function in an even more productive and innovative manner they need to eventually develop a shared-access organizational ecology that is not an extension of the controlled-access continuum. Let me explain this very important consideration in more detail with the help of several models. 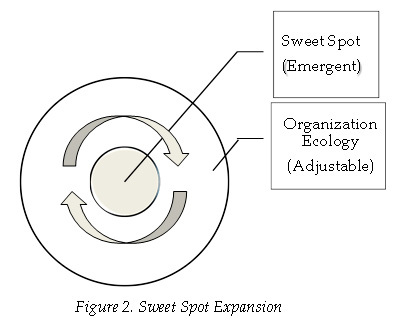 First, in very general terms, Figure 3 portrays how the sweet spot of a controlled-access organizational ecology can be expanded. It’s accomplished by gradually flattening a hierarchical organization. Many approaches have been taken to do exactly that by many enterprises primarily in the industrialized countries. Some of these interventions undertaken fall under such labels as total quality management, team building, workplace democracy and organizational learning just to name a few. They have been and continue to be used to make a workplace more productive and engaging. They also provide some of the benefits attributed to shared-access organizational contexts. However, the main point to consider from Figure 3 is that as long as a venture has some sort of a hierarchy in place, no matter how flat it may be, it is still a controlled-access system. Figure 4 should help to clarify this point further in addition to illustrating why an enterprise would want to make further efforts in developing into a fully functioning shared-access system. Note that this model has an additional component not shown in Figure 1. Looking at a controlled-access ecology in more detail sheds light on the fact that there are two informal networks at work in the system, not just one. That is, you have both a management and a worker informal network trying to separately interpret the formal system’s requirements as to what actions need to be taken in order to satisfy organizational goals and objectives. In addition, the management informal network members have more “assigned” power not only in the interpretation of the requirements but also in how those requirements should be carried out. Is it any wonder that in these sorts of dynamics much of the possible efficiencies, more innovative processes and worker engagement suffer considerably? The good news is that things don’t necessarily have to turn out that way. First, in flattening the hierarchy in a controlled-access ecology more and more of the management and worker informal networks overlap. This process expands the sweet spot and increases an organization’s productive and innovative capacities. There is, however, a limit to how much the two informal networks can overlap in a controlled-access environment. Only in a shared-access organizational context can the management and worker emergent networks fully overlap bringing with it an additional enhancement of the sweet spot. In order to gain the additional advantages of an all-inclusive shared-access workplace ecology an organization needs to abandon the top-down management principles of a controlled-access system completely. 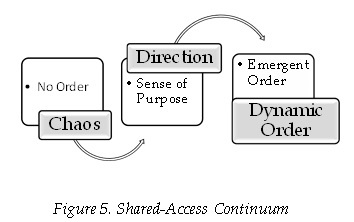 Such a system now becomes part of a totally different continuum as depicted by Figure 5 where management control is replaced by “dynamic order” generated by the interactive principles of self-organization or self-management. 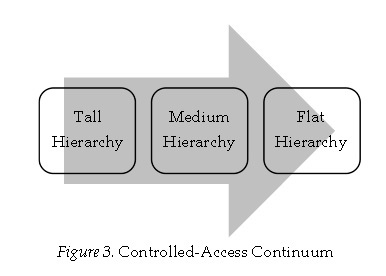 In looking at Figure 5 it should be apparent that the shared-access continuum is quite different and completely separate from the controlled-access continuum. This scale starts with chaos and progresses to dynamic order. More importantly there is no “static” or prearranged management structure governed by “assigned” leadership positions. Instead, leadership in a shared-access system is emergent or situational and doesn’t come with position power. Rather, it’s based on value-added knowledge facilitation. Let me elaborate with a couple of examples to clarify what I’m describing. Let’s start with the box labeled, No Order. An example of that would be what I call a “country-club” situation. People come together to associate and have a good time but there is no specific purpose for the gathering. The next box, Sense of Purpose, is when someone or several people come together in order to pursue a specific goal such as starting a new business based on some unique idea. Clearly, here there is a sense of direction as to what needs to be done but specific details and responsibilities have yet to be agreed upon. Finally, in the Dynamic Order box people and their ideas have jelled. Systems and processes have been set in motion and a team of people is working together based on self-imposed commitments, not management directives. What should be kept in mind is that a new or an existing businesses wanting to develop a comprehensive shared-access work environment seldom, if ever, starts in the first box. New ventures usually start in the second box and then move into the third. Existing enterprises usually take the same route. That is, they first make up their minds to develop themselves into a shared-access framework and then get on with the job. In both instances the organizational activities should be founded on four general self-organizing principles. They include individual autonomy, a shared identity, challenging aspirations and catalytic leadership. These principles are descriptive and not prescriptive because every organization is composed of different people and aims. Individual autonomy includes a strong sense of role responsibility, personal commitment as to what needs to be accomplished, empathy and attunement towards one’s colleagues, and the necessary talents and skills to be able to contribute towards the accomplishment of agreed upon organizational goals. A shared identity is comprised of a strong sense of belonging by the entire organizational membership. This requires the enterprise to be composed of tightly interconnected groups that are limited to about 150 members. Such groups also need to value diversity (diverse individual identities) and reciprocal relationships. Challenging aspirations include much more than a grand vision. It is all about the pursuit of all sorts of possibilities. That includes shared aims and common incentives. It also places considerable weight on individual goals and incentives. Both need to be well balanced. Moreover, considerable time needs to be set aside for reflection to assure that everyone is on board and that the organization is headed in the right direction. If everything is accomplished in following these four “general” principles, the outcome should look something very similar to Figure 6. What is noteworthy is the fact that the management informal networks have been eliminated. That, of course, is the result of the complete overlap of all the informal networks. They now work together. The other key result is that the organizational sweet spot has been expanded as much as possible. What should be kept in mind is that the sweet spot is not a static entity. It is constantly expanding and contracting as conditions change on a daily basis. All it takes is for one member of the venture to have a really bad or a really outstanding day. The reason for that is quite straightforward as depicted by Figure 7. The compilation of an organizational sweet spot is nothing more than the individual member sweet spots coming together at any point in time. In today’s Knowledge Age organizational leaders need to reach beyond the “management toolbox” and leadership mindset of the Industrial Age. In doing so they may realize that complex adaptive systems, such as social networks, can be influenced but not managed very effectively. In essence, the key to success in today’s rapidly changing global environment is to grasp the fact that there is a duality to organizational effectiveness. Thus, enterprises that will continue to stay on the controlled-access continuum may not prosper as well as those that jump on board the shared-access continuum. Inherently, leaders should learn how to “unmanage” more and place less and less emphasis on traditional management founded on control, compliance and even fear. Charles (Kalev) Ehin is an author and recognized innovation dynamics authority. He is emeritus professor of management at Westminster College in Salt Lake City, Utah, U.S.A. where he also served as the Dean of the Gore School of Business. His latest book is The Organizational Sweet Spot: Engaging the Innovative Dynamics of Your Social Networks (Springer, 2009). His website is UnManagement.com.